I have an on going love affair with vintage lamps. While we have many of them in our little cottage, whenever I find one while I am out at a garage sale, a thrift store or an antique shop, it's hard for me to pass it up. To me, they look so sweet. They represent another era when life was a bit more simple and easy. Of course my husband likes to tease me that we should notify the power company of a power surge when we turn off all of the lamps in the cottage for the night. So ... to celebrate this 1 year anniversary of Show and Tell Friday, here I am to light the way. Happy Anniversary Cindy!! Do you want to help your Mum turn off some lights before we go to bed?? This is my vintage cranberry scoop. It is hanging in my kitchen underneath another vintage thingie. Bentley and I are very excited. We were given an award by Pets Direct in England. Thank you John for bestowing this award upon us. Bentley and I are very honored to accept your generosity. Please go visit Pets Direct and please don't forget to visit our lovely hostess, Suzanne, The Colorado Lady for another weekly Vintage Thingie Thursday. Are you excited Bentley? Just think ~ an award from your homeland. If we could bypass the quarantine, Momma would book a trip for us to visit your homeland soon!! Wait a minute, you should start calling me Mum! It's Rednesday!! Be sure to visit Sue at It's a Very Cherry World for more "just because" reds. No Bentley, I promise that I will not spray paint any of your toys! Near the front door is a little shelf that I salvaged. I painted it white, added a vintage post card and painted a few little flowers on it. Now I am using it to store the postal basket and my favorite vintage train case. We don't get quite as many letters as we once did, but I still love to put the mail we still do receive in one spot. I'm joining Marty for Table Top Tuesday and Linda for Nifty Thrifty Tuesday. Have a wonderful Tuesday! Bentley, you love the postman don't you? You always give him a big welcome and a kiss too when he stops by each day. Here is a pastel drawing I completed years ago of my first Yorkie, Bitterman. I have not been doing too much drawing or painting lately, but recently I have been thinking about writing and illustrating a children's book. I'll keep you posted. Bentley ... Will you pose for Mama?? It was a wonderful sunny afternoon in Idaho ~ just perfect for hanging some quilts on the line. The sun and our fresh air makes the quilts smell fresh and clean. There is nothing like a cozy quilt to cuddle up in on a crisp, cool fall evening ... especially one that's pink and one with touches of pink! Beverly has more pink touches for us this Pink Saturday. Be sure to pick up the link and check it out! Bentley ... are you ready to play the making the bed game?? As you know by now, there is a lot of dog "art" around the cottage. I love this little vintage puppy and kitten cup and saucer. But wait ... how about miniatures??? This could go on for a while, so until I decide please visit some great blogs to see what other bloggers are playing with today. Stop by to see my friend Debbie at Debbie-Doos, Color Outside the Lines for Vignette Fridays, and don't forget Cindy at My Romantic Home for Show and Tell Friday. How do you like that doggie vignette Bentley?? Recently I found the cutest vintage table runner with a crochet border. Love the bright colors and of course especially the reds. Then there is this cute little strainer/lifter thingie. I think it's really a child's cooking utensil, but I just couldn't resist it and I know that I will use it too! 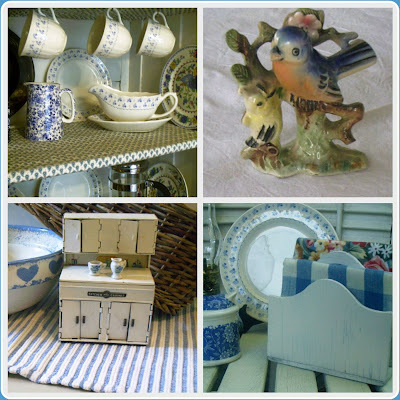 So to show off my latest finds I am linking to Sue's It's A Very Cherry World for Rednesday and then over to Suzanne's Colorado Lady for Vintage Thingie Thursday. Have a fun day! Do you think that we could pick up some of these toys Bentley? I'll help you. I have been having so much fun editing photos and exploring new possibilities that I decided to post my efforts on a second blog. While I love color ~ especially red and blue, I have always appreciated black and white photos, films and vintage TV shows. The two bloggers who inspired me to take this leap are Brenda of Cozy Little House fame ~ her new blog is A Fairy in My Garden, and Claudia of Mockingbird Hill Cottage whose new blog is Through a Lens Daily. You already know that they are great photographers, but on these new blogs you will see more of their great work, just make sure that you continue to visit them at their other blogs too! My new blog will only have one photo per post and an inspirational quote ~ something to give you a bit of encouragement. Stop by and visit us when you have a chance at Black and White Nostalgia. Bentley will be popping in there from time to time too, and of course we will still be showing off our colors at Ash Tree Cottage. By the way Bentley, are you outside? Momma has a bit of a cold today and she's in a fog. We have three desks in our cottage. One is a large trestle style desk that belongs to my husband. I have two desks. One in our office where I can be creative, and one that I call my little business center. Inside the drop down desk is where I store all of the household accounts. On top of the desk is my sweet vintage chalk dog and a vintage chalk scottie bookend. This dear little bookend is holding up a few favorite books ~ Walden by Thoreau, A Tear and a Smile by Khalil Gibran, a book of French grammer, and a book of dog cartoons. Bookkeeping can be tedious and it's not my idea of fun, so these cheerful little touches keep me smiling! Well, it's getting late. Time to turn out the light and call it a day. Before I do, I plan to head over to Marty's for a quick peek at some of the other participants for tomorrow's Table Top Tuesday. Sweet dreams everyone! Sweet dreams to you too Bentley! Whatever Bentley is doing ~ whether he is watching for squirrels, wearing Mardi Gras beads, smiling for the camera or just being Bentley, he is as cute and as sweet as can be. 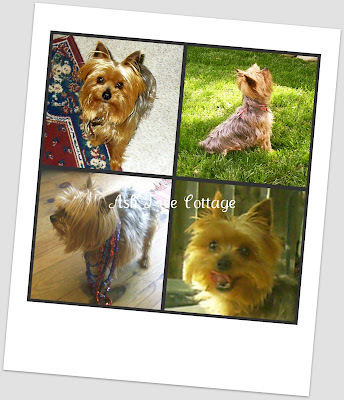 So I'm showing off some of my many Bentley pics in a mosaic for this week's Mosaic Monday at The Little Red House. Be sure to stop by and visit Mary! Yes Bentley, you are very photogenic! It's a beautiful morning here in Idaho. Have a wonderful Sunday! We have been having some very lovely weather here in Idaho. Our evenings are especially lovely. So tonight we are having a romantic dinner on the deck. We are dining on vintage Limoges soup bowls and plates in the palest of pink patterns. Enjoying some ice water and a bit of wine from vintage stemware. Complimented by some lovely vintage silver flatware. Bentley ~ would you like to say anything? What about dinner? Don't worry Bentley, I have a lovely dinner for you too. Red fat quarters just longing to be part of a red quilt. They could be this fall's quilting project. I wonder what Sue of It's a Very Cherry World has for us this Rednesday? When we head off to work each day, Bentley likes to curl up on a quilt on the bed. Isn't that right Bentley?? You don't have any separation anxiety while we are gone do you?? When my husband and I were newlyweds, David was transferred to Virginia~Specifically Northern Virginia. We felt as though we were in heaven. Virginia is a beautiful state. Rolling hills and lots of history. Some of the best fall fairs I have ever attended are in that lovely and sweet state. We spent every spare hour exploring, but our favorite place was Williamsburg. Whenever I think of fall, I think of Williamsburg. Historic Willliamsburg where the harvest was so important and celebrated. Williamsburg, home of quilts and candles, cozy nooks and history. Home of William and Mary College. While we were in Virginia, we had the advantage of traveling. We visited Williamsburg as often as we could. We went to brunch often at the historic Williamsburg Inn. We ate fabulous seafood at Christiana Campbells, actually met and sat by the fire with Roy Underwood of PBS fame. Roy and David discussed the size of the hearth and the draft of the chimney. It was a glorious time. So tonight, as fall rapidly approaches, I am thinking of a time that was very special to me and to David. A time early in our nation's history. A time of simplicity, a time of thankfulness and a time of beauty. Today I am linking with Marty for Table Top Tuesday. I am thinking warm fuzzy thoughts. I hope that you are too. 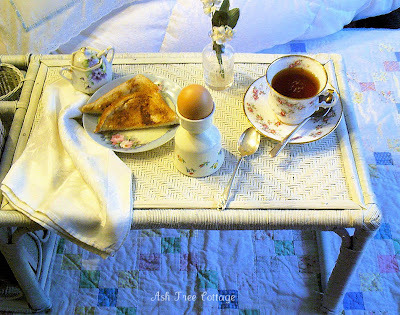 By the way, my dear Mother-in-Law hand stitched the lovely french style quilted table cloth beneath my vignette. Her own parents were native Virginians. Bentley ~ I think we need to take you on a cross country trip back to Virginia. I know you will love it!! Ever since I learned how to make mosaics I am just having so much fun combining photos from around my cottage. So ... Today I am joining Smiling Sally for Blue Monday, Mary at The Little Red House for Mosaic Monday and Cielo at The House in the Roses for Show Off Your Cottage Monday. Thank you girls for being our lovely hostesses each Monday! Bentley ~ should we make a mosaic of you napping? You look so cute!! September 11, 2010 is a day few of us will ever forget. Approximately 2996 lives were lost on that day when our nation was attacked. How many tears were shed on that day and how many tears have been shed since for loved ones who were lost? In honor of those who lost their lives, I dedicate this post to their memory. I believe that Beverly and others will be posting special tributes as well. Please no compliments on this post. If you would like to share your feelings about this tragic event, I am happy to read them. I love this country so very much. I never want to see this happen to our nation again. Yee Haw ~ It's a Barnyard Bash!! and an old straw hat! I have some Mary Jane's Farm magazines for you city slickers to bone up on farming!! Hi Girls!! Are you headed out to the pond for a swim?? Enjoy the pond while we go visit some of our chicken friends!! Hi Girls! My don't you look pretty today. Do you have any eggs for us?? Wait I see Bentley. Bentley where are you headed with your brush?? I said BASH not BATH!! Poor Bentley looked like he was in a panic. Luckily he already had a bath this week, so he's safe for a few days! Wasn't that fun?? NoW please go visit our friend Lynn for more Barnyard Bash fun and please visit Cindy at My Romantic Home for Show and Tell Friday!! Who knows ~ You might get to see more chickens! Honest Bentley, you aren't getting a bath today! It's safe to come back!! I have a little collection of vintage dolls. In the center is my Wendy Doll by Madame Alexander. Wendy is all ready for a vintage school day in her cute outfit. Wendy is even wearing cute saddle shoes. Then there is a very, very vintage Ginny doll. She is wearing a cute little red turtleneck with a red plaid skirt. She has her cute little Wire Hair Terrier pup with her too. And finally a bit more current, yet still vintage Ginny, wearing an even more vintage Ginny dress. I am linking up with Suzanne the Colorado Lady for more Vintage Thingie Thursday fun. Bentley, lets look through your toy basket. I know that you have inherited some vintage toys from Bitterman!! It is Rednesday isn't it? Whenever there is a Monday holiday, I seem to be one day off for days. Since I am assuming it is in fact Rednesday, I am showing off my red towel holder with a new red velvet cupcake recipe towel. Isn't it cute?? And ... next to the towel is my red apple pie plate. The recipe for the pie is printed on the bottom of the plate. How handy is that??? See, here is the recipe. Since the recipes are so handy, I suppose I will have to bake some red velvet cupcakes and an apple pie very soon!!! While I am gathering the ingredients, please go visit Sue at It's a Very Cherry World for some more fun for this Rednesday. Bentley ~ please check the calendar. Bentley is assuring me that it is Rednesday. Thanks sweet pea! !